Charlene Chang and Jalees Mohammed of Singapore’s Public Service Division share their tips for service innovation. Large, complex structures are not designed to move quickly and be ‘agile’. In 1912, the RMS Titanic failed to course-correct in time and collided with an iceberg in the North Atlantic, resulting in over 1,500 casualties. The sheer mass of something so large, combined with its established momentum, results in an inertial force that makes it difficult to shift gears and change direction. The same principle can be applied to large groups of people working together in a bureaucracy. In his book Bureaucracy, James Q. Wilson notes that government agencies are averse to taking risks, because they are given specific, clear and unquestionable goals. This means large numbers of public officers (mass), combined with an established rhythm or momentum (norms and cultures), that results in a great reluctance to change course ‘in the way things are done’. This inertia and the resistance of government agencies to change is untenable today. The accelerating pace of technology and the widespread use of artificial intelligence and data to provide anticipatory products and services to consumers, increases their expectations of public services. The public sector has a monopoly over public services, but comparisons with private sector services are unavoidable, and the trust between citizens and government is at stake if the latter consistently falls short. In Singapore, Prime Minister Lee Hsien Loong has said that “the world around us is changing very quickly, the competition has become stiffer. Minister of Finance Heng Swee Keat remarked that “our ship of state is a small boat in a turbulent ocean.” Several advanced economies, such as the US and UK, have adopted a more inward-facing stance in recent years, owing to domestic pressures. Meanwhile, key trading partners the US and China are engaged in a trade war that will affect small economies like Singapore. The ‘fourth industrial revolution’, characterised by data, artificial intelligence and all things digital, is already upon us, forcing industries to rethink their business models. Meanwhile, our population is ageing, which will lead to a significant increase in healthcare and social expenditure. This will also mean a shrinking resident workforce, a tightened labour market and economic slowdown – unless we do something about it. Singapore is also among the most diverse countries in the world, so, harmony and mutual understanding are absolutely essential for stability and well-being. In essence, the need to innovate and, at the same time, maintain operational excellence, weighs heavily on a small country that needs constantly to find ways and means to stay afloat in a volatile global economy. How do you keep a 145,000-strong public service nimble? The answer is to create a culture of experimentation and entrepreneurship, so that every public officer can make a difference in his or her area of work. The Singapore Public Service has a rich history of promoting continuous improvement and innovation. Under the Public Service 21 movement in the mid-1990s, the Staff Suggestion Scheme (SSS) and Work Improvement Teams (WITs) were set up as platforms for all public officers to take part in continuous improvement. SSS gave individual officers a platform to suggest workplace improvements; and WITS improved workplace productivity by giving officers the tools, such as Six Sigma, to improve work processes. Leaders were expected to support these platforms, and agencies to report their participation rates to the Public Service Division (PSD). Every officer was required to be a member of a WIT and offer suggestions for improving work processes as part of the SSS. Over the years, we evolved our approaches to embedding innovation among our public officers. In 2012, we replaced WITS and SSS with new ways of promoting innovation, such as makeathons and and hackathons. These events bring together public officers and citizens to define problem statements, interview stakeholders and ‘make’ or ‘hack’ prototype solutions to problems. The prototypes are then refined through user-testing and mini-interviews to shape what a final product might look like. Between 2013 and 2015, makeathons were conducted by different public agencies on topics such as designing libraries of the future and reducing waste at large-scale events. Agencies have also run public hackathons to generate IT solutions. The largest to date, Hackathon@SG 2015, supported by 18 public agencies, saw 1,100 participants build solutions for healthcare, urban living, city planning and public services. How might we make the Public Service more vibrant and productive? How might we create a Public Service that officers are proud to be a part of and can deliver seamlessly? They attracted more than 100 public officers and generated useful ideas. One was for a ‘marketplace’ of professional skills that public officers could share with agencies that needed skills such as event hosting or graphic design on an ad-hoc basis. The aim was to tap into officers’ talents and willingness to go the extra mile, instead of purchasing services from vendors. rally directors to contribute solutions to an issue of national importance. The challenge statement for the makeathon was, “How might we realise Singapore’s Smart Nation vision, to support better living, stronger communities and create opportunities for all?” In all, 29 directors from 21 agencies participated, interviewing citizens in the Tampines area of Singapore, and coming up with ideas. One was for a customisable mobile phone app, activated by dialect-friendly voice commands, that senior citizens could use to track their health and diet and locate social activities nearby. Makeathons tightened the nexus between ideas, core work and implementation. Some makeathons focused on key government priorities that cut across agency boundaries, and the solutions were assessed by senior public sector leaders. This provided officers with a platform from which to work on problem statements and focus on implementing ideas. They learnt to adopt a citizen-centric approach in scoping problem statements and developing solutions iteratively. The Public Service Innovation Challenge (PSIC), created in 2017, brings officers together across agencies to co-create solutions and get funding for experiments. This addressed public officers’ feedback that there could be more support to encourage innovation and bypass tedious approval processes. The Innovation Challenge provides seed funding of up to $70,000 for experiments with new ideas or prototypes. For the Challenge’s first two open calls, 305 officers have submitted over 100 ideas. Two that have been implemented and scaled across different agencies are: a simple, time-saving digital application that can aggregate news and social media information on specific topics; and an easy-to-use ‘form builder’ for converting paper forms into simple electronic ones that can be embedded in government websites, avoiding expensive solutions. Makeathons and the PSIC have had a real impact in generating quick, useful solutions – other agencies have begun conducting their own makeathons and challenges to meet specific needs. ‘experimentation’, to try ideas, test assumptions and gain evidence-based validation for proposals. The Lab builds an innovative culture by injecting new ways of thinking and uncovering new insights. An example of its impact is found in its consultancy with the National Library Board. The Lab facilitated discussions and identified the board’s aspiration for a library of the future. A key component of the intervention was to help the board identify ‘pain points’ for customers using library services. The Lab then focused on identifying the service improvements, capabilities and technology tools required to provide visitors with an experience that matched their aspirations. 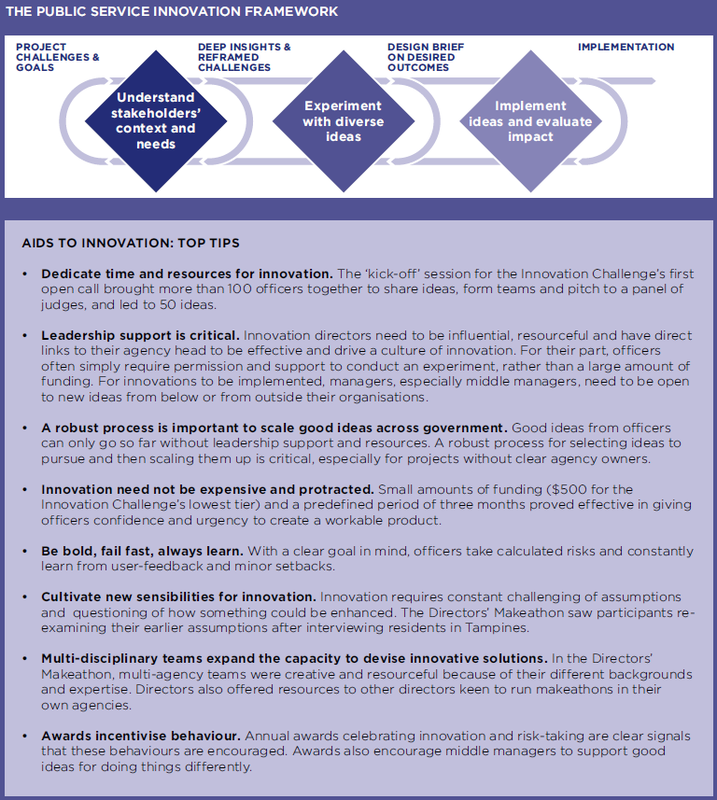 Over the last four years, the Innovation Lab developed an innovation framework to cultivate an empathetic, collaborative, experimental, inquisitive and skilled Public Service to, in turn, generate repeated innovative successes. Equipped with a common mindset, language and suite of innovative tools through the sharing of best practices in the innovation framework, public officers with varying experience in innovation can now ignite it to resolve problems. The Public Service Innovation Process Framework (PSIPF) consists of disciplines including behavioural insights, business process re-engineering, data analytics, design thinking, organisational development, scenario planning, and systems thinking, blended to help deliver better outcomes for citizens. This framework (see graphic above) is not a linear process. One can start anywhere in the process and iterate, but completing the key steps is recommended to ensure consistent and holistic outcomes. The framework is also an open-source guide, and is not exhaustive or prescriptive. The Public Service Centre of our Tampines hub was the result of successful innovation guided by the PSIPF. The service concept, using the conceptual service model, brought six service agencies under one roof: those that oversee community and social cohesion, housing issues, job training and job placements, other social services (such as financial help), and sports activities. To help visualise the real-life issues this model might face, a full mock-up of the Public Service Centre was created for the project team to simulate its processes in various scenarios. Scripts were written for volunteers to role-play real customers, so that they could stress-test the actual service centre. Through this low-resolution prototype, the team was able to gain valuable insights and improve its processes and service model. PSD partnered with the Amalgamated Union of Public Employees and the Ministry of Education to better understand the challenges faced by more than 2,000 Operations Support Officers (OSOs), many of whom were not confident conversing in English. Guided by the PSIP, the project team conducted a visual mapping exercise to describe a day in the working lives of OSOs and identify the ‘pain points’. The team also sat the national Workplace Literacy and Numeracy Test (mandatory for OSO promotion) and found it to be irrelevant to OSOs’ job scope. The data produced by this research, coupled with empathy, gives the team the information to push boundaries and deliver policy changes to the benefit of officers’ careers, skills and salaries. In 2019, we will be experimenting with an improved version of WITS. Every public agency will be invited to examine their workplace processes and the citizen’s experience when using public services, and then to re-engineer those processes to save time. We will be setting a common and measurable goal of hours saved through streamlined processes or reduced manpower, to energise and mobilise the Singapore Public Service. Charlene Chang is Senior Director, Transformation, Public Service Division, Singapore and Jalees Mohammed is Senior Assistant Director, Transformation, Public Service Division, Singapore. This article was first published in the UK Government’s Civil Service Quarterly and was published under an Open Government Licence.